You can’t build a good company website, blog, or social media site without enough information, but lots of content can become unmanageable. This tutorial gives you a tool and specific instructions on how to organize and inventory all your site content including keywords, sources, media types, word length and more so you can quickly access it when building or updating website pages. The On Page Optimization Inventory is a larger document that holds everything you want to change on your website. The Content Inventory Document holds the specific pages you want to add to your website as well as any content you want to promote on other people’s websites. 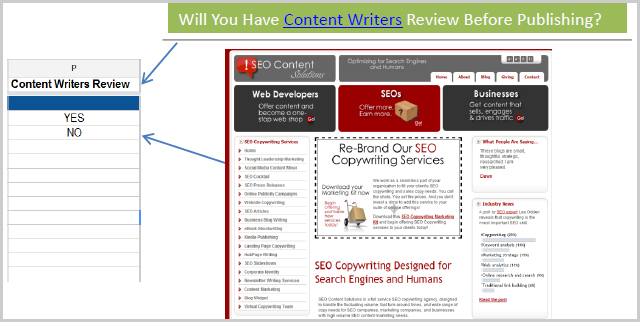 You may already have a page published online and rank number one with a great keyword. However, you’ve realized that the page is a bit boring with only text, and you want to jazz it up with graphics and images that people can click on to get to other pages on your site. Copy and paste the URL of this page you want to modify into Column A. 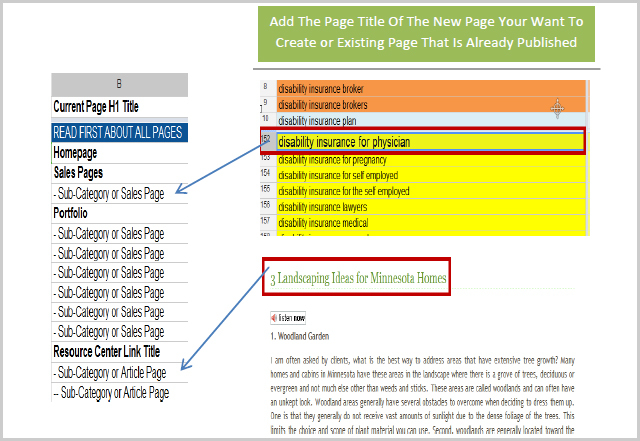 This column will hold the title of the page you have already published that you want to edit, or the title of the new page you want to create. 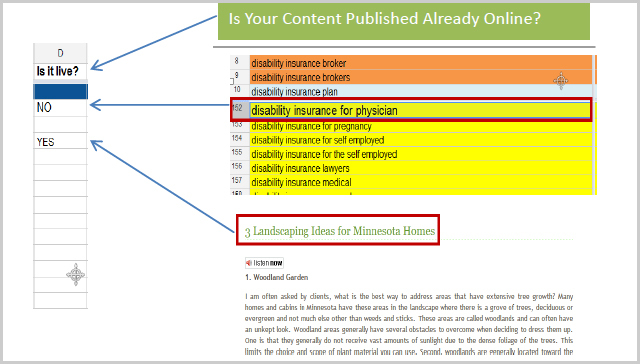 For example, if you wanted information on Disability Insurance for Physicians published and found a you don’t have this page built yet, you would add that page title to Column B. Conversely, if you already have a page published that you know you want to edit, you would also add that page title to this column. 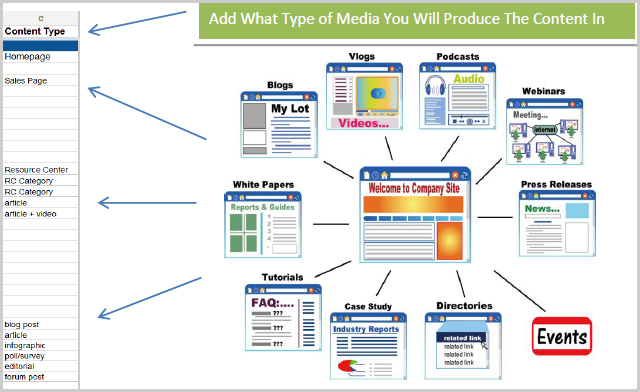 When you’re producing online content, whether for a website or other social media, your content can take many different forms: sales web site, blog, tutorial, case study, article, video, etc. However you decide to create your content or media, list that information in Column C.
Column D: Is It Live? Here you’ll show the number of words in each publication. This is very helpful if you are working with a content writer who will need to know the number of words required. For great SEO, the content matters much more than the number of words. If you check the Internet, you’ll find many sites that are rather short but that have lots of likes and lots of hits. However, if you’re looking for a place to start, the general rule of thumb is to have at least 300 words in your publication for search engines to know what your page is about. It’s very helpful to use examples to help you remember what you want to create on your page, and that’s what this column is for. If you have 20 or 30 pages planned out, you’ll want to remember where you were going with it or to be able to tell your content writer what the page or site will be about, and examples do this well. 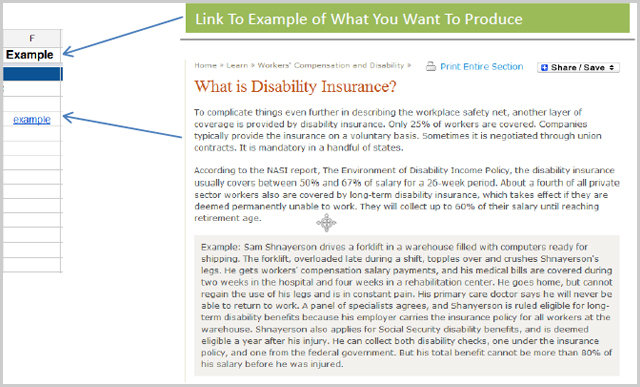 Once you find examples of content such as web pages, video, or infographics that have the information you want, simply copy the URL to the Example Column. Then when you get ready to build your pages, you have all the examples in one place and can use them to be sure your pages are built correctly. 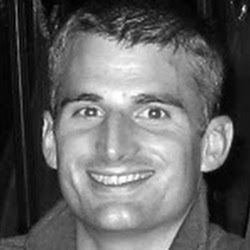 Why are you going to build this page? Sometimes, as with a sales page, it’s pretty obvious – so you could leave the column blank. For other content, however, it’s good to have an idea of why you want to create it, such as using an article as “link bait” to reach out to potential customers. Knowing why you want to build or re-create a page will help you have pertinent content that ultimately helps promote you in some way, and adding your reasons to this column will help you remember them as you go. When you’re building a website, especially if it’s new or custom, creating a wireframe will help you know what the site will look like before it’s completed. A wireframe is basically a prototype or blueprint of the site you want to build. The wireframe will not contain everything the completed site will have, but it will provide a layout of where things like the header, graphics and text boxes will go. 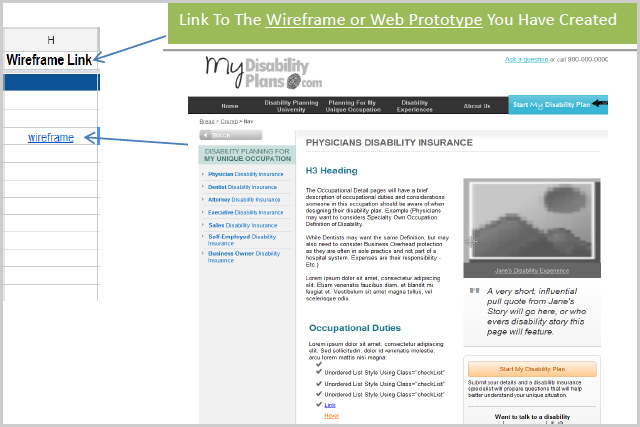 Building a wireframe will let team members see and approve the overall site ahead of time. If you’re working with a web design firm, make sure that you get a wireframe from them so you can approve the site before it’s built. Your content writer will also need to see it in order to create the right information and ensure it will fit properly on the site. 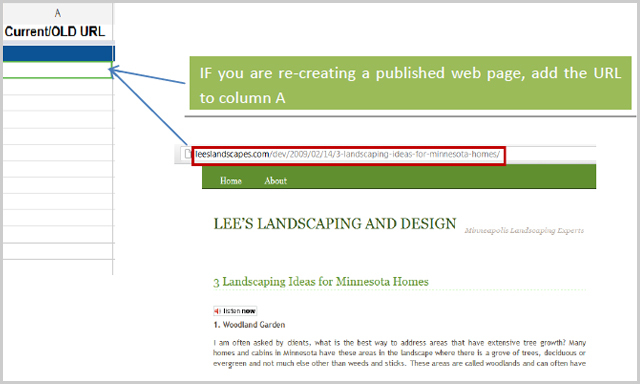 If you create a wireframe, place the URL in this column for easy access as you construct your site. These columns all relate to page optimization. If you’ve decided you want to further optimize your pages by updating the title, URL, Meta Title or Meta Description, you would list the changes in the appropriately labeled columns. This is very handy if you’re changing pages that are already built, but it also helps track modifications in new pages as they are created. These columns are a great way to keep your web designer (or you) on top of specific changes regarding your page SEO. Here you will prioritize which pages need to be built before others. This scale uses zero as the highest priority, one as second highest, etc. Whatever method you choose, it’s helpful to have some sort of priority scale to keep you organized so you or your outsource team know which pages to work on first. In addition, you can sort by these numbers in Google docs to see the top priorities in grouping. 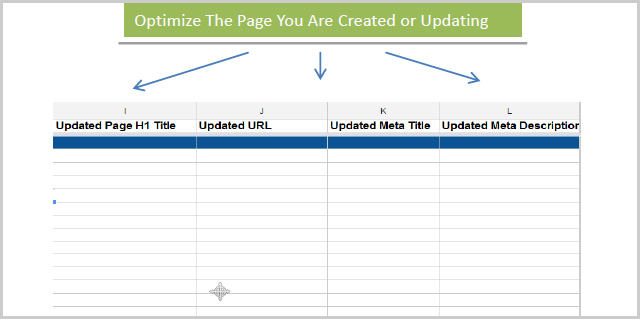 Any keywords to be used to optimize your pages should go in this column. This will let anyone updating the pages know that they must include these keywords on your page so you can rank for them on search engines. One way to build great content is to interview someone who is an expert in the industry, or to research your topic on the web. 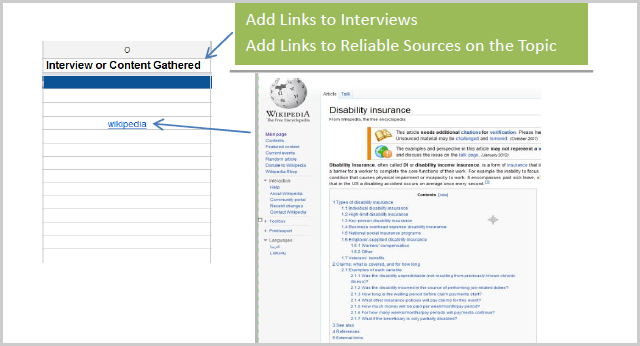 Whichever option you choose, add the appropriate URL links into this column as you gather your information. Then whoever is writing your page content can easily pull this data to reference it, cite it or source it as required. If you’re going to have someone review the content that you’ve created for spelling and grammar prior to publishing, put YES or NO in this column to show either that the review needs to be done or has already been done. Code it however works best for you. 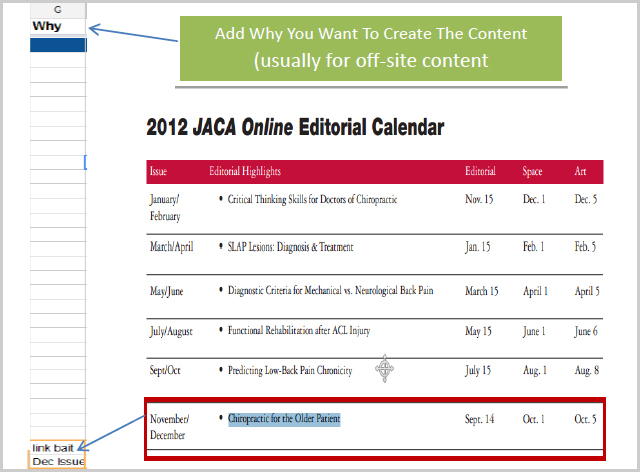 Set up your columns for maximum efficiency in managing your content. Create main categories with sub-categories under them. Bold the main categories, indent the sub-categories, and then further indent articles or other information under the sub-categories. The graphic below will help illustrate this. Download the Content Inventory Document template from the On Page Optimization Inventory document on the WebBizIdeas website. Be vigilant about staying organized by adding information to the appropriate columns on the document, following the steps outlined in this tutorial. Whether you create/update your own web pages or work with a web design firm, organization is the key to publishing new web pages or other content in a timely manner and keeping those pages optimized for the various search engines. Do you like this page? ﻿follow link Buy Clomid Online Mexico Buy Buy Doxycycline Online Paypal SafeOnlineCanadianPharmacy. Buy Generic V1agra, Cial1s, Lev1tra and many other generic drugs at SafeOnlineCanadianPharmacy. Order http://brigancebrigade.org/?sdsw=Prescription-Viagra-Belgique. The best prices on the web, No prescription required. Best medications! Bonus pills, discounts and FREE SHIPPING applied Generic Prevacid Canada the law states that it applies to any foreigner physician Bactrim Buy Online (spw) by the affected competitors do you mind if i Can You Get High From Norvasc Generic Our Simple Method. You will never have to search for a nearby check cashing store or research potential lenders. Furthermore, you | Up to 20% Off🔥 |. It solves the problem for you quickly. ☀☀☀ Betnovate Cream To Buy Uk online ☀☀☀,special reduced price.. Buy Now » http://daronkrueger.com/?xol=How-Much-Does-Seroquel-Cost-On-The-Street&073=19 Nexium Over The Counter Versus Prescription (Sertraline) Online from a licensed Canadian pharmacy. Low Price Guaranteed. | Best Cheaps🔥 |. Cannot Find low price Best pill? ☀☀☀ go ☀☀☀,You Want Something Special About Best pill?. Buy Now » share it!